Rovio, the maker of app "drug" Angry Birds, has actually managed to follow up with an even better game, Amazing Alex (Free or $0.99 for premium). Even though Rovio acquired the game from an indie developer, it's been given the addictive Rovio treatment: lots of short, fast, physics-based challenges that make it difficult to put down. Apple iOS users are already sucked in. According to Apple, Amazing Alex became the number one paid iPhone app in the U.S. on its first day. But while testing this on Android, I felt the gravitational force too. There's no flinging or violence against animals in this game. In the terribly-named Amazing Alex, you rearrange toys and household items to create a Rube Goldberg machine. As an item drops on your design, it sets off a chain reaction that sends existing objects richoceting off each other; your goal is to collect the three stars located in every challenge board by hitting them with these objects. For $0.99, you get loads of game time and a good mix-up of challenges to keep your noodle flexed. Fortunately for most of the world's smartphone users, Rovio launched iOS and Android versions of the app at the same time. Sorry, nothing for the less than two percent of you out there using Windows Phone. I tested Amazing Alex on a Galaxy Nexus with Android 4.0, but with all the objects on screen it'd be more fun playing this on a larger screen. It doesn't really detract from gameplay but I wasn't excited about the storyline or simplistic graphics. 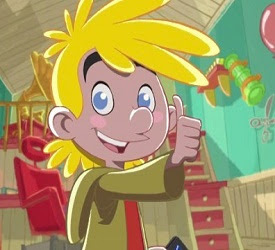 Amazing Alex puts you in the role of a generic-looking kid named Alex, a "whiz kid with a boundless imagination and a houseful of fun toys" which is far less creative (and controversial) than the violent birds in Angry Birds. Every new challenge board presents you with a few items: three point-amassing stars, random objects to build your Rube Goldberg device, and a trigger object?like a balloon or magic eight ball?that starts off the chain reaction. Drag objects around your screen to rearrange re-orient them. When you hit the "play" button, the trigger object starts your Domino effect. Unlike in Angry Birds, you can take as many turns as you need to pass each challenge board. It'd be more fun to limit this, however. What keeps this game interesting is that every level presents different objects with different levels of kinetic energy. ?Furthermore, a dollar buys you more than 100 challenge boards, spread across four levels?classroom, backyard, bedroom, and tree house. But even after you've completed them all, you're not done yet. After you pass the classroom level (containing 16 challenges), the app unlocks a fifth level, My Levels, where you can create your own challenge boards and share them with the Amazing Alex community. Once you've created a level, which can take anywhere from 30 seconds to hours depending on how difficult you make it, you can share a download URL for other Amazing Alex players. Angry Birds was like a comfort-food app and something I could play on a train without straining my eyes. Amazing Alex, not so much. But if your Angry Birds addiction is wearing off, Amazing Alex is a fun, much more challenging alternative.